Once the printer was out of the box and up on the desk, I noticed the exterior is almost entirely black except for a blue detail that separates the front of the case into upper and lower sections. Some might say the new design of the SureColor P800 is sleek. It’s definitely less angular than its predecessor. Apparently it takes a lot of tape to get the SureColor P800 to you in one piece. Give yourself 20 minutes or more to find and remove it all. The “Start Here” guide gives some clues as to where you should look but don’t be surprised if you miss a piece or two. As long as the packing foam that locks the head into the right side of the carriage is removed, it’s unlikely there will be any serious damage when the printer is fired up for the first time. Another note about the unpacking. Once you get clear of the tape you’ll notice some thin plastic peeking around the edges of the cartridge bay door. Don’t attempt to remove this. During the start up process this door will unlock allowing you to install the nine 64 ml. starter cartridges. The plastic will be much easier to remove and you won’t risk damaging the door or the mechanism that locks it closed. The Stylus Pro 3880 had a very flimsy front door connected to the output tray, which could be easily snapped off if you weren’t careful. A much beefier door on the SureColor P800, attached directly to the printer body, has replaced it. When you push the upper edge of the door in toward the printer it lowers itself gently to the open position. The output tray located behind the door feels more robust as well. The SureColor P800 has a control panel that pivots from a vertical position, flush with the front of the printer, to almost horizontal. I was surprised how much I liked this feature. The information on the 1 5/8” x 2 3/16” color touch screen display is easy to see when standing in front of the printer or seated nearby. The icons on the display are large and easy to read. From the touch screen you can check ink levels, change from photo black to matt black (and back again), set up wireless printing, and access the setup menu where you can perform maintenance and get yourself into all kinds of trouble. To the left of the touch screen is the power on/off button, the return button to aid in navigating backward through the various menus, and my personal favorite, the home button, which takes you back to the home screen when you are finished performing a task or when you find yourself somewhere in the menu system that you really don’t want to be. The touch panel also plays host to a variety of guides to help the user load sheet and roll paper into the printer. I’ll write more about this in another post. The sheet feeder on top of the printer is where papers of standard thickness are loaded. It will hold up to 30 sheets of 8 1/2” X 11” of luster or glossy paper. The paper support extends high enough to support a 22” long piece of paper and seems up to the task. The SureColor P800 lacks the rear feed manual feed slot for fine art papers that was present in the Stylus Pro 3880. Fine art papers, as well as media up to 1.5mm thick, will now be loaded through the manual feed tray in the front of the printer, located just above the output tray. At first glance I saw this as a negative. 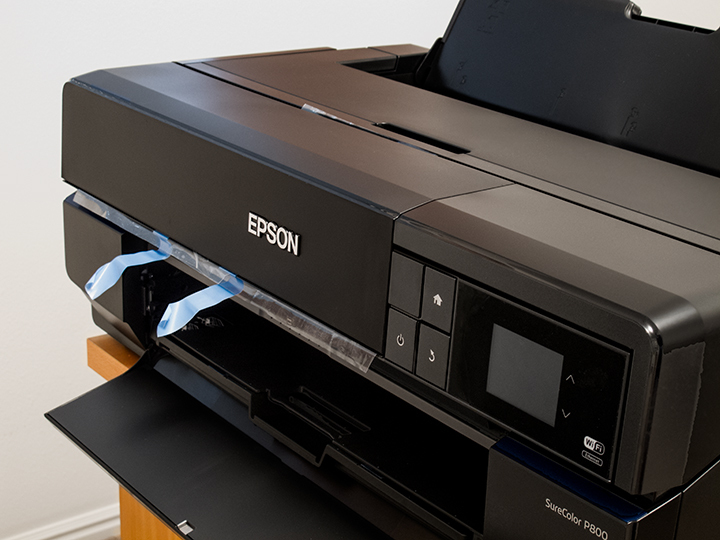 Then I remembered how reaching around the back of various Epson printers to load paper into the rear manual feed slot, without sending it in askew, had caused me to express myself in a way that would not make my mother proud. Even though it requires more steps, perhaps front loading is a better way to go. Again, this will be part of another post. The inks are loaded. The driver is installed on my computer. I’m almost ready to do some printing. Before I get started I’’m going grab the Gretag i1 Display 2 staring up at me from the desk and calibrate my monitor. Those starter cartridges won’t last forever but with a calibrated monitor I’m likely to get the most out of them. 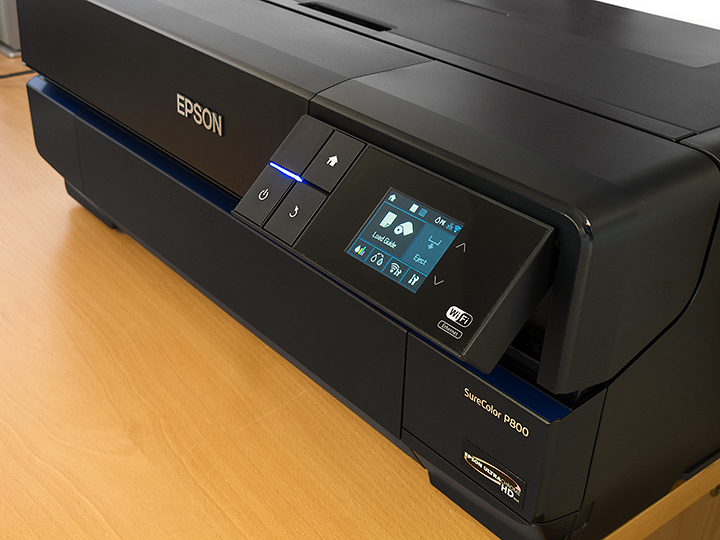 Inkjet printing gets a lot more economical when the first print you make is the one you want to keep. Next time I’ll put the SureColor P800 to work. I’ll find out how well that front loading works, do the switch from photo black to matt black, and see how it works with fine art papers. In upcoming posts, I’ll try out the roll paper adapter, check out the Epson profiles for the SureColor P800, print wirelessly, and much more. Stay tuned. Thanks for the post. Looking forward to setting mine up. Would be interested to hear about your results with your first prints and papers. 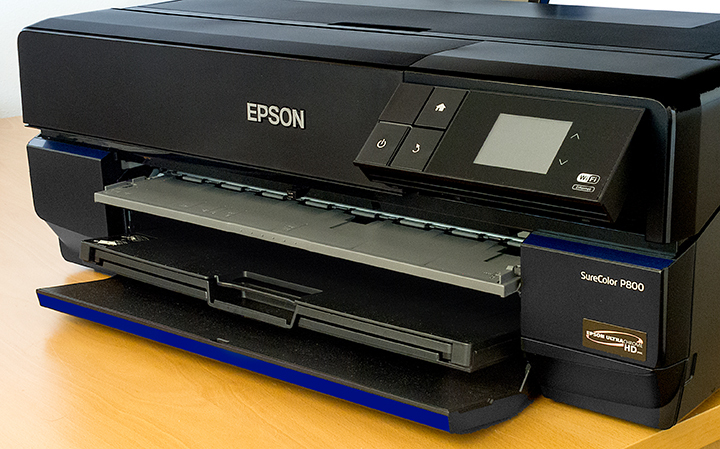 After the initial setup, is the printer set to use Photo or Matte black ink? The printer is set to use Photo black after initial setup. Photo black can be used with the luster paper enclosed with the printer for initial nozzle check and print head alignment. Thanks for your question. Much appreciated. Thanks, George. Now I know which images to line up so I'm ready when it arrives! I answered your second question but not your first one. I have been printing on Premium Luster and Premium Glossy papers as well as the Canson Rag Photographique. Stock profiles so far but the results have been excellent.